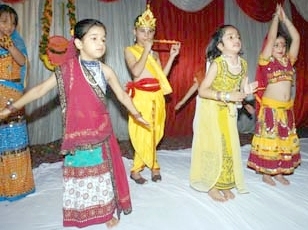 Janmashtami was celebrated with fervor in Green Valley . Euphoria for the festival was not just restricted to Mathura – the birth city but pervaded in the society with such a festive mood . The birth of Lord Krishna is one of the most popular festival of Hindus and the occasion was celebrated to the hilt. A cultural programme of One and a half hour consisting of dances like, Yashodha Ka Jhula , Handi Fod , Krishna leela, Ras leela, Aaj Radha k sham yaad Aya, Gopiyo ka dandiya ,Sham chodhi bejana aya ,Yashomati Maiya ,chote chote dahiya Woh Krishna Hai. Skit play Sudama and Sushila with Mitra Krishna and how the one handful of puffed rice given to Sri Krishna changes the life of Sudama and Sushila.The last item was the ladies garbha dance. 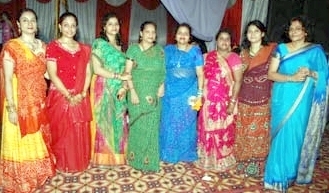 and sharp 12 clock Krishna temple pooja started withe ladies singing beautiful bhajans . The entire cultural programme was organized as per the various avatars of Lord Krishna and we had young children come and narrate the particular period followed by the programme. The entire programme organized by Mrs Seema Bhalla ,Master of cermony Mrs Anshu Pandey, dance chorographers Mrs Jagruti , MrsPoornima , Mrs. Aroushi ,Mrs. Shristi and Mrs Rakhi convener Mrs.Raji Kurup. The society exelled in the festival spirit and also not forgetting in bringing the unity in the society and also educating our little children in knowing their culture.